Welcoming host at the door. Very clean and tidy room bathroom had plenty of space. A lovely place to stay. Wonderful hospitality, comfy beds and a delicious breakfast. We stayed three nights at B &B Craigard and we enjoyed it. Kind welcome from Dee, the landlady. 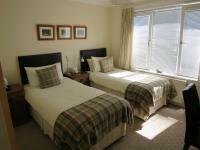 Nice and spacious room, with large wardrobe and 2 dresser. New and modern furniture. Comfortable bed with the choice of two cushions. The bathroom is also large. TV / DVD in the room and choice of DVDs and books available. All clean and tidy. Good and abundant breakfast with fresh food. Dee has bought lactose-free products on purpose. 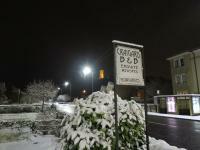 The location of the B &B Craigard is very convenient. 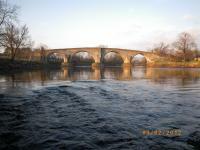 It is located on one of the main streets of Stirling, a short distance from the historic center and the Wallace Monument. There are parking spaces and there is also a bus stop in front of the house. We strongly recommend it. Room is comfortable and bathroom and toilets are clean and in compliance with international standards. Environment is quiet, bus service to city center. Host is friendly. Very welcoming,very clean comfortable accommodation,great breakfast.We would return. Craigard met and exceeded our expectations. It was so clean and comfortable and we were immediately made to feel at home. Breakfast was delicious and filling, conversation enjoyable. Room was small but very clean and comfortable. Breakfast was to order and outstanding.Easy parking.Very relaxing view of the back garden.Quiet location.Close to Stirling castle and the William Wallace memorial. We had a really good time at Craigard. Great location for both the Castle and the Wallace Monument. The room was clean and comfortable. Breakfast was delicious and the host was very kind. We really enjoyed our stay. We were only here one night in response to a rail strike, but everything was perfectly luxurious.The bed and linens were extremely comfortable.The room was a good size, with plenty of desks, outlets and places to put all your travel gear.The bathroom was recently re-done and very lovely.Everything was spotless and the breakfast was great!Just wish we could have spent another couple of nights! We only stayed one night and it was awesome :clean, quiet, comfortable (even if the room was a bit small), warm welcome.Excellent breakfast, the best we had during our tour in Scotland !If we return to Stirling one day, we will certainly stay in Craigard B&B. We had a great stay. Our room was nice and very clean. The owner was very friendly and made us a delicious breakfast! Immaculate accomodation, and very Nice breakfast! The room was very comfortable and extremely clean. The owners were very, very helpful with directions and helpful tips about the city. Liz and her husband go out of their way to make you feel welcome and at home. Great breakfast - a variety offered. 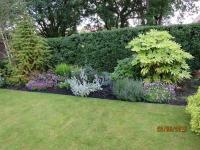 It is also in walking distance to the city centre. I recommend staying at this b&b.I plan to go back to Stirling in May and will surely book the same place again. 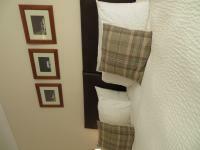 Very nice place with so kind owners who will make sure you have a comfy stay. The location is perfect and in a quiet area. Very good accomodation, welcoming and friendly ownwers and very good breakfast. Very recommended. I was treated very well.The room was very pretty and clean.I would highly recommend this location. Stayed with my wife for 2 nights. Room immaculately clean as was the ensuite (good shower). Nice and quiet. Plenty of parking. Great breakfast. Liz &Pat (owners) a lovely couple - very helpful.Highly recommended. Lovely stay. Liked the location. Our host was extremely pleasant and offered advice about the surrounding area, things to see and places to dine out.The accommodation was immaculate and clean.The breakfasts were first class too. Craigard B&B was the perfect last stay of our vacation. 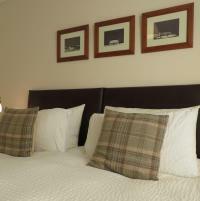 Everything was spotless and very clean, the bed was large and comfy, even the room towards the street was quiet. Breakfast was excellent, would definitely recommend staying there!! This was the most pleasant B&B I have experienced. Very high standard in all respects. The location is ideal for both Stirling itself and the university (my son was graduating). I stayed three nights and valued every moment, including wonderful breakfasts, generously appointed room, and characterfully warm, helpful and generous hospitality. Room was incredibly comfortable and everything was pristinely clean.Breakfast was delicious and every selection that you could possibly want.HIGHLY recommend a stay. We found Ms. Liz Fitzpatrick to be both a gracious and helpful hostess. She explained local traffic and how to get to places we wanted to go (e.g., Stirling and Doune castles). She provided excellent breakfast selection and preparation. Finally, we found the room rates (we rented two) to be very reasonable and comfortable. 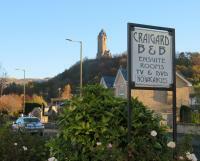 When we stay in Stirling again, we will definitely try to book a stay at Craigard. Just spent another couple of nights at Craigard (using as a stopover travelling to the Orkneys and back) Once again we had a lovely welcome and the room was clean and comfortable.We had a wonderful breakfast each morning and would recommend the establishment to anyone be it for one night or longer. Clean, friendly, loved the room decorWarm. Delicious and bountiful breakfastComplete with a hot powerful shower, a variety of teas, coffees and also a hairdryer.Parking too!Really can't fault it.Location within easy walk of the monument or a slightly longer walk to town/Castle. Just had a lovely nights stay at craigard. We were attending a wedding at the nearby rugby club and the owner very kindly dropped us off. Room was a good size, very comfortable bed and very very clean. Breakfast the next morning was lovely too. Would definitely recommend staying. Was ideally located, lovely views to Wallace monument. 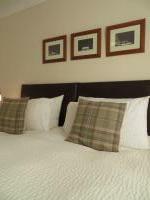 Host very welcoming.Room exceptionally clean and well appointed.Excellent Scottish breakfast.Very good rate. We really enjoyed our stay at this b and b. The owners were very friendly and helpful, providing leaflets and maps for local sights, cooking a tasty breakfast in the morning and even giving us a lift to the station when we left. We would definitely come again. Craigard B &B was immaculate.The food was good, the hostess was very helpful.We loved the community breakfast table which allows you to get acquainted with the other guests.It's a very friendly time.However, it is not within walking distance to much beyond Wallace Monument.There were few places to walk to for dinner.Further, our bedroom was very tiny, which would have been ok if there had been a common room to sit in, to read or relax.That said, if you're just passing through and only need a place for the night, it's perfect. Lovely weekend. We stayed two nights to be close to the venue for a family wedding. Room comfortable and spotless. Facilities were everything we needed. Car parking provided right at the door. The hosts were very attentive and friendly. Would certainly stay with them again. Great bed and breakfast.Made to feel really welcome.Room was very nice and good breakfast.Will certainly be back for another visit. Very comfortable, and clean. I had a great experence. Liz is a great host, she welcomed me kindly. Her chat is enjoyable. I really loved that place, its breakfasts and little cookies. very friendly and welcoming service. Room was clean and comfortable, breakfast was excellent. Overall no issues. Deff value for money. Very friendly and comfortable. The room was clean and fresh,lovely shower. If I'm in Stirling again I would definitely book at Craigard. A great B&B kept to a high standerd ,in a good location. A nice friendly welcome to breakfast each morning and a good scottish breakfast to start the day. Confortable, Clean, homey, good cooking, definitely recommended! We stayed for 3 nights and were very satisfied. The situation of the house is perfect. 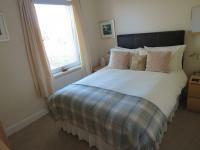 Just 20 minutes from the city center and overlooking the Wallace Monument. But best of all, the deal offered by the hostess. Liz treated us very well and we are very grateful. craigard is in a great locatioN and the hosts are very accommodating.would recommend this B&B to others. The place was clean and cozy. Very clean washroom. Breakfast was delicious. The owner, Liz, was super nice and approachable! I would definitely recommend this place to my friends and family! Posto molto carino, simpaticissima la gentile proprietaria e una colazione super, vi consiglio le salsicce vegetariane. It have been a pleasure to sleep there for one night.The Breakfast was aweson and the treatment was really nice.I would recommend to a friend. Highly recommend, beautiful home and our room was spotless.Our hostess was friendly and helpful and made us feel completely at home.Fab breakfast too.If I ever revisit Stirling I will def stay here. I had a wonderful stay in Creigard. The room was very nice, clean and the linen was eksellent. Thank you for beeing such a great host - you are wonderful people, and I really loved to stay in your home. Friendly,clean and comfortable and a good breakfast. We had a great time in Stirling, the guesthouse was nice and tidy, the rooms were very comfortable and the breakfast was amazing! Excellent service, thank you so much. We stayed for one night in April 2013 and had a most comfortable stay. We had a friendly welcome, the room was spotlessly clean and the breakfast nicely cooked. I really loved my stay in Stirling at Craigard house. Liz was a gracious host who went above and beyond to make my stay fun and easy. Craigard is a great place to stay in general, but it was certainly welcome for the solo traveler. Thanks again! Excellent place to stay. Very Friendly people and lovely breakfast. We thoroughly enjoyed our two-night stay at Craigard. The facility and hospitality of our host were the best. She was extremely helpful with suggestions of places to visit and also provided great conversation. We couldn't have asked for a better place to call "home". I have chosen this B &B before because it is an excellent place with lovely breakfast &friendly welcoming hosts. Bedrooms have everything you need for a very comfortable night. A very high standard all round. I stayed with my husband in "Craigard B&B"for a week, and it was absolutely excellent. We are happy with our choice because we have greatly enjoyed Stirling and our stay in Craigard.We can frankly recommend this B&B because it was excellent in many aspects:the service, the place, the cleanliness, location and mainly because of the hospitality. And the breakfast was delicious!!! !Surely, we would be very pleased to come back to Stirling and to "Craigard B&B".